The Dickinson Civic Association Pool hosted a fantastic swim meet! Pearland Oilers defeated Cy Fair Bobcats to capture the 2014 Regional Semi-Finals at U of Houston Cougar field. Congratulations! Cajun Phil of Lake Charles, Louisiana endorses Anchor Marine Insurance for a commercial for his Saturday morning TV fishing show. The background music is “45 Southbound” by Galveston’s Kevin Anthony. 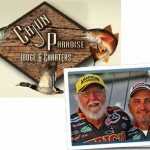 Cajun Phil is the owner of Cajun Paradise Lodge & Charters with his son Capt. Kevin Broussard. Cajun Phil has over 60 years experience on the waters of Calcasieu Lake, also known as Big Lake in southwest Louisiana. History Channel’s T-Roy Broussard of Swamp People insures his fingers and equipment with Anchor Marine Insurance!